Our clients were a young family who were quickly outgrowing their starter home. The wife is an artist who has a distinct and hip style that we didn’t want to change. Our goal was to keep the fun personality of this family while highlighting the best features of the home. 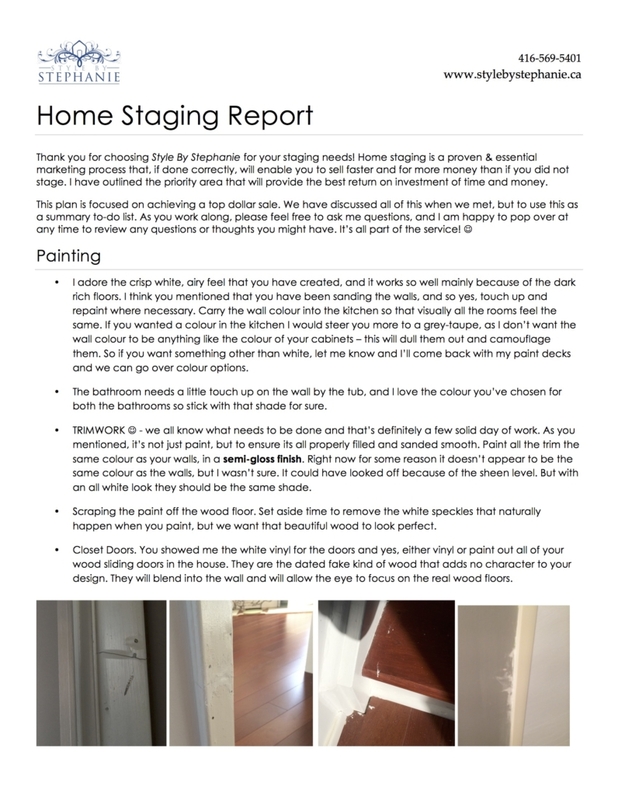 We don’t believe that staging must = beige. Our clients had a very artistic eye and they knew that the presentation of their home was an important aspect to their sale. 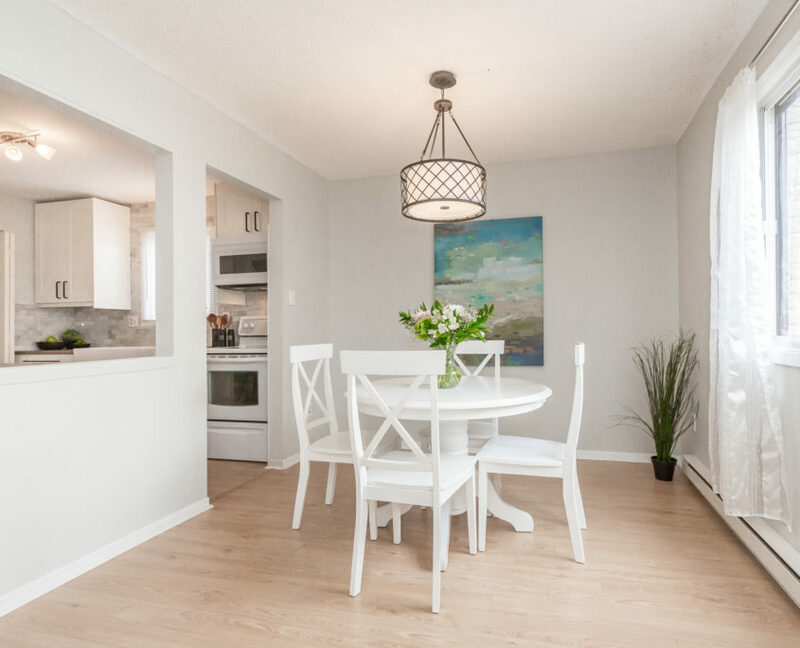 The home already presented quite well; they had installed beautiful wood floors, updated the bathrooms, and painted the walls a modern white to show off the client’s artwork. They knew the home just needed a few finishing details, as the kitchen floor needed repair, and they we’re sure how to spruce up the bedrooms. This home is a great example of many of the homes we do. Most homes don’t require a complete overhaul, as many home owners fear. 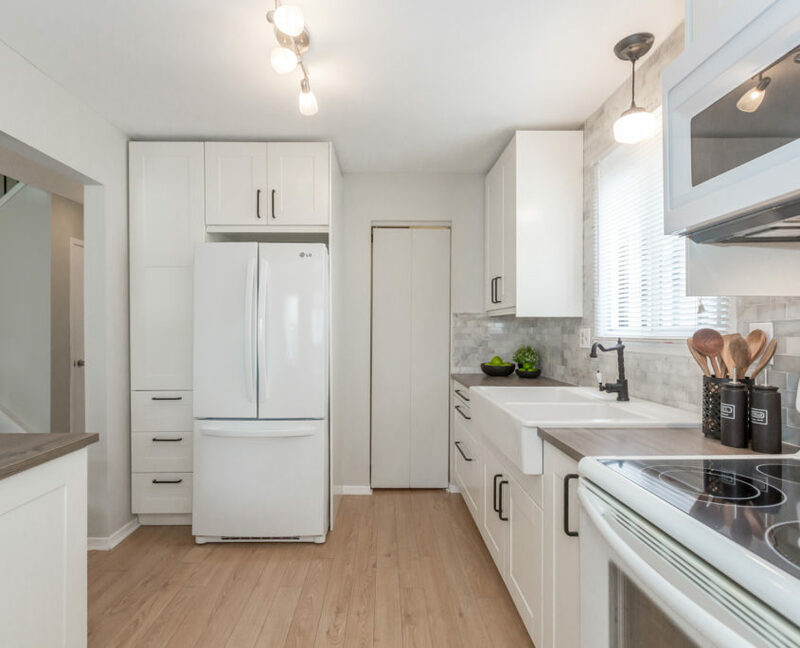 Many times it’s just one floor, or a counter, or a paint colour that the owners know need addressing, and are wise enough to call in professionals to make sure the right choices are made to make sure the home presents the best it can for sale. 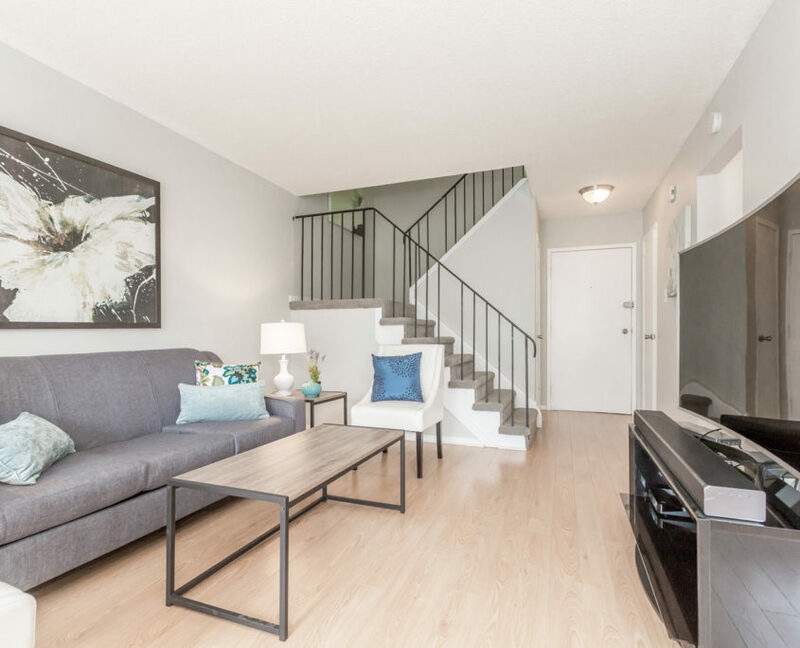 As with most couples, they couldn’t agree what floor option was best, so Stephanie, our Home Stager/Interior Designer, offered options and helped mediate to a solution. Luckily, the home owner was handy and was able to do the repairs himself. This is a major advantage since 90% of home buyers don’t want the headache of repairs. Every time a home owner can fix an issue instead of asking the buyer to deal with it, vastly increases the desirability of the home, thus protecting your equity. 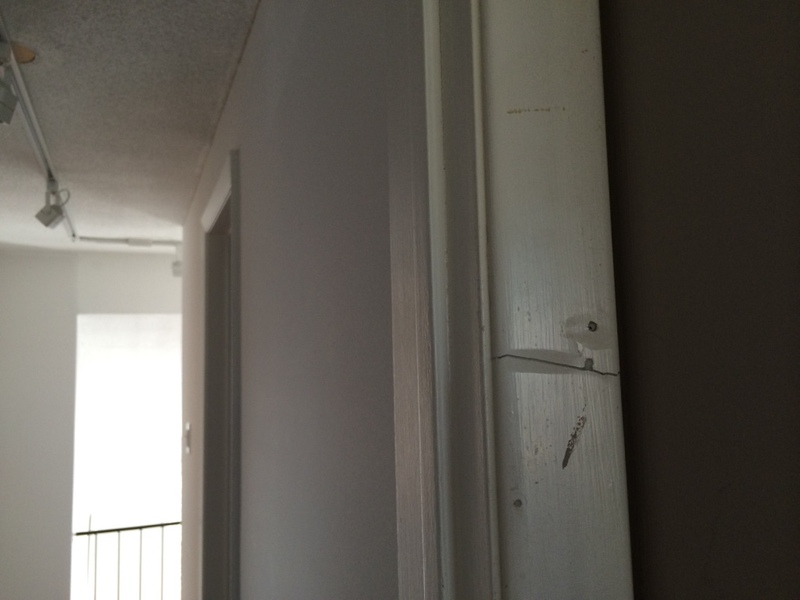 The main goals for the home were a lot of little fixes and repairs. 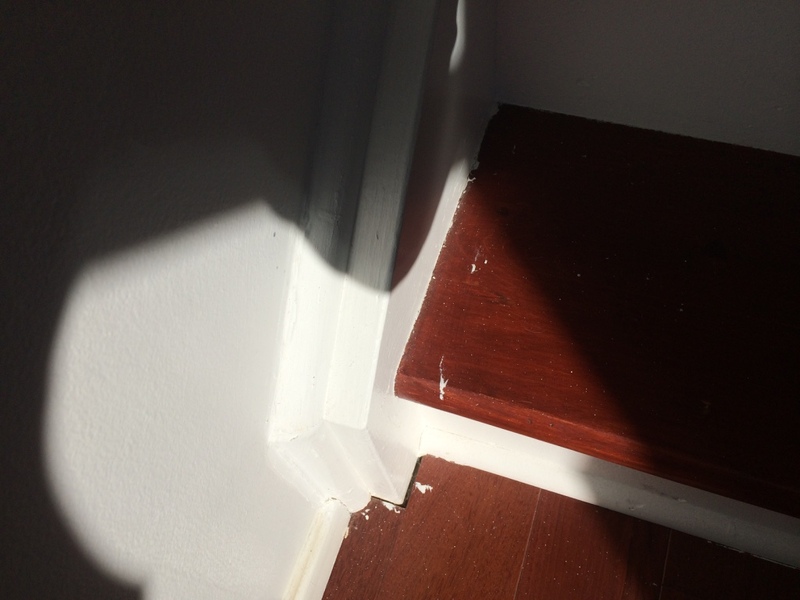 The trim work was original to the 40 year old house and was showing its age; it needed to be sanded, filled and repainted. Our home owners knew that the devil is in the details and trim is a major sign to buyers about how well the home is loved and taken care of. 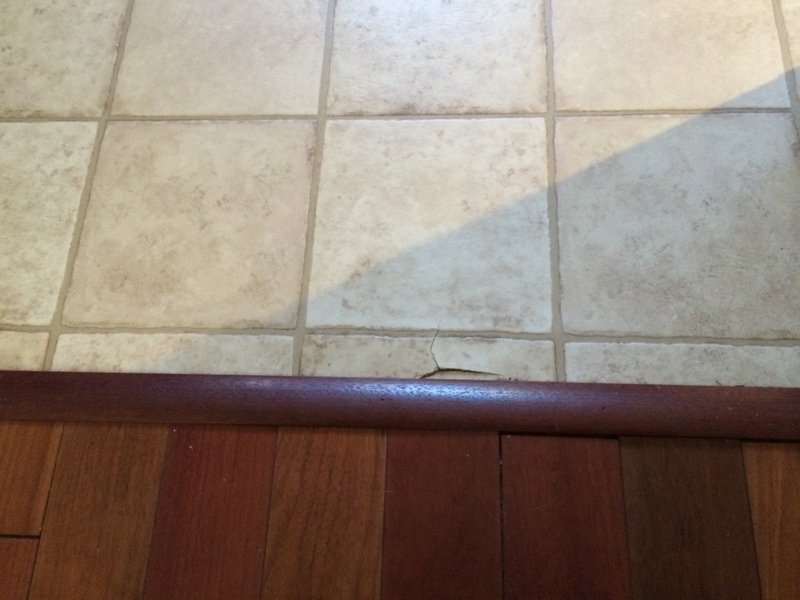 The kitchen floor also needed replacing with a more durable material. 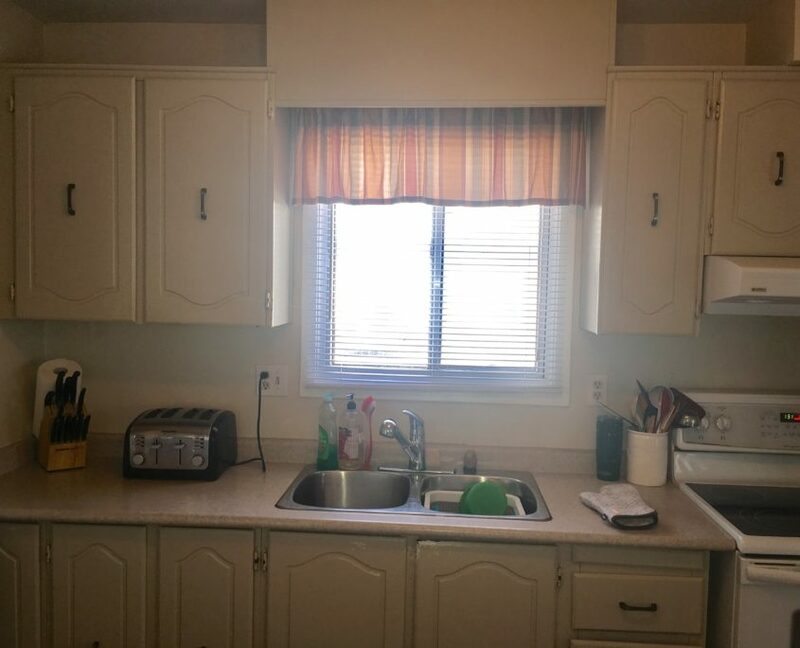 Below are some photos of the oh-so-common fix-ups that can be found in many homes, and which our home owners knew they could take care of to create a fresh, crisp, turn-key look. We always provide every home owner a clear plan which breaks down each tasks into detail. 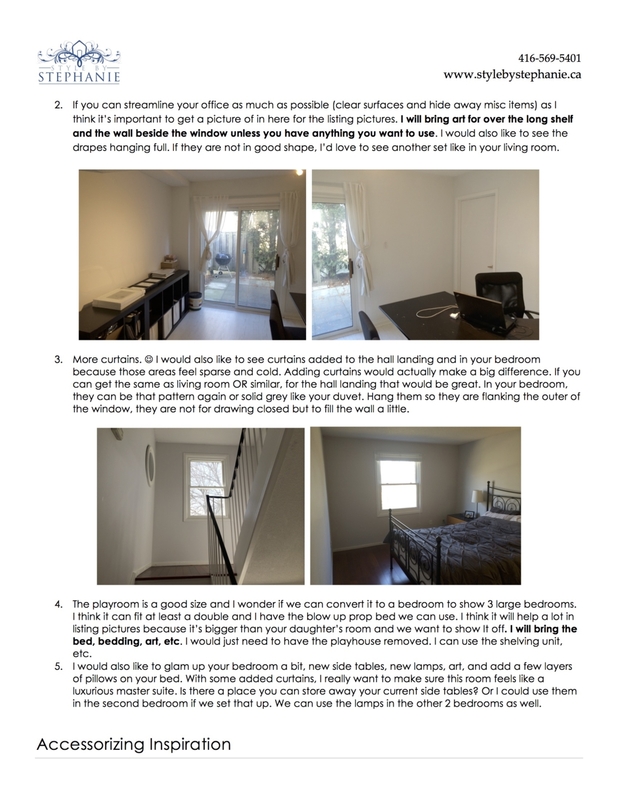 Stephanie takes her time to ensure the plan is achievable by considering timeline, skills, and budget of the home owners. This is never to become and overwhelming process and we feel that working TOGETHER with the home owner is of critical importance to success. 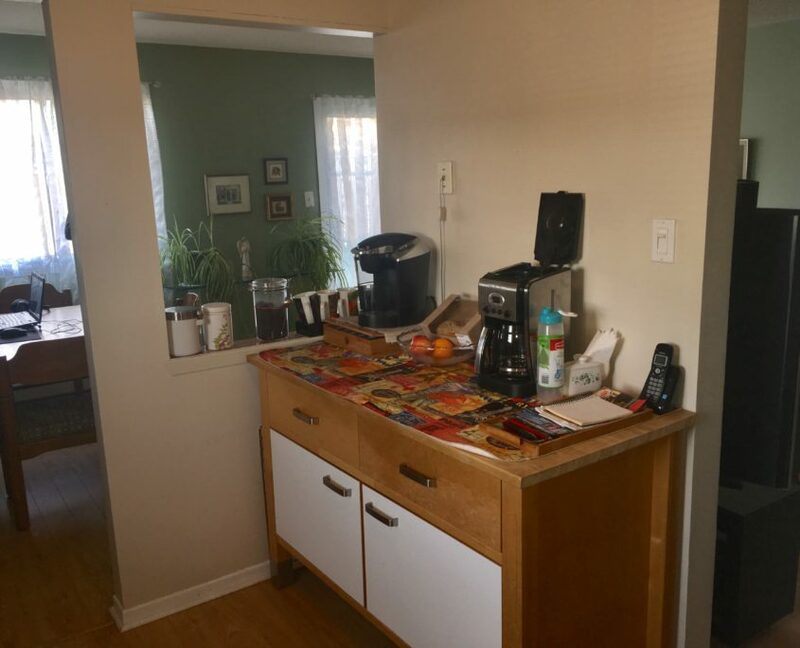 The home owners jumped in with both feet and resolved the minor issues with their home without hesitation. Stephanie is always available throughout the preparation process, but in this case, we have to say that she wasn’t needed very much. So she focused on planning her staging installation so that this home would look the best it possibly could. 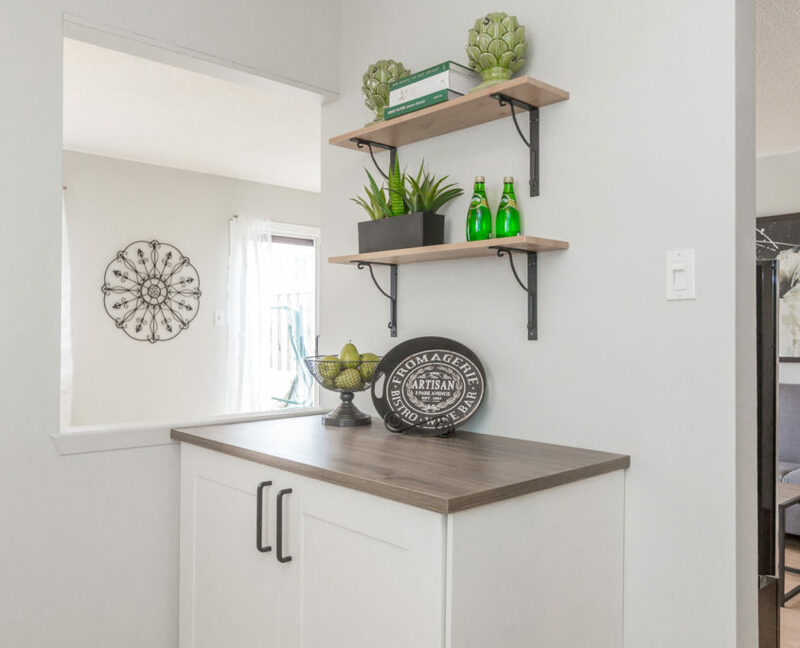 It’s easy to say “free staging” in passing, but that often overlooks the hours spent selecting, inventorying, packing, moving, unpacking and installing the items in the home. And then it has to be done all over again after the house sells firm to return all items back to the warehouse. Stephanie spends a minimum of 6 hours of back end work the home owners never even see, plus the day to install and uninstall the props. To stage properly, with all of those vignettes, focal points and consistent scheme, it takes many hours, which make a significant difference to the end results. The main floor of the home was a strong green colour, very popular in the late 90’s. When selling a home, we don’t want to have any bold references to how old the house is, because most buyers do not like older homes. Even if they know they have no choice but to buy an older home, if given the choice, they would buy new. 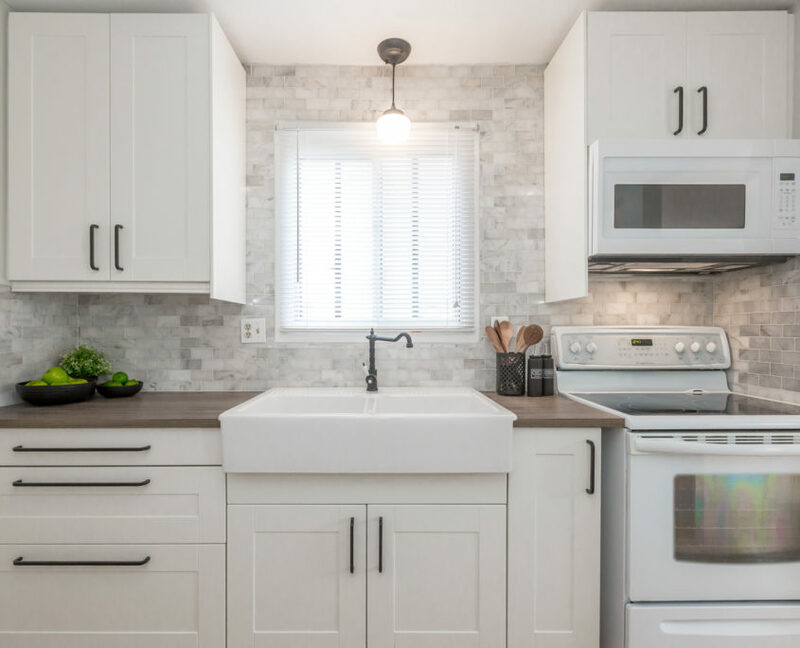 So the best thing you can do if you own an older home is to find economical ways to inject a contemporary feeling – and paint is the cheapest and easiest way to do this. We needed to keep the new colour the green family, because the carpet on the stairs was a dark taupe-green. As ironic as it sounds, if there’s something in your home that you can’t change (tile, carpet) and it’s not a neutral colour, the best way to downplay it is to add MORE of that colour. Think camouflage. If you add any contrasting colour you will draw attention to it even more. The new colour can be a modern, pale, toned version of the bold tile or carpet, but it has to be the same colour family. Another dramatic change we made was to remove all of their furniture on the main floor and bring in our prop furniture for staging. 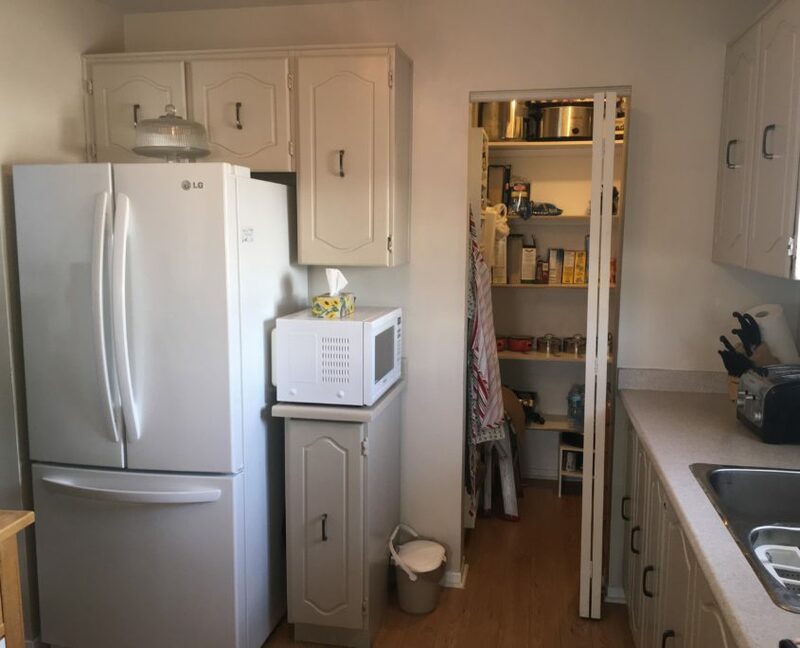 This was only possible because they had the storage space to keep their furniture, and they knew they wanted an updated look. 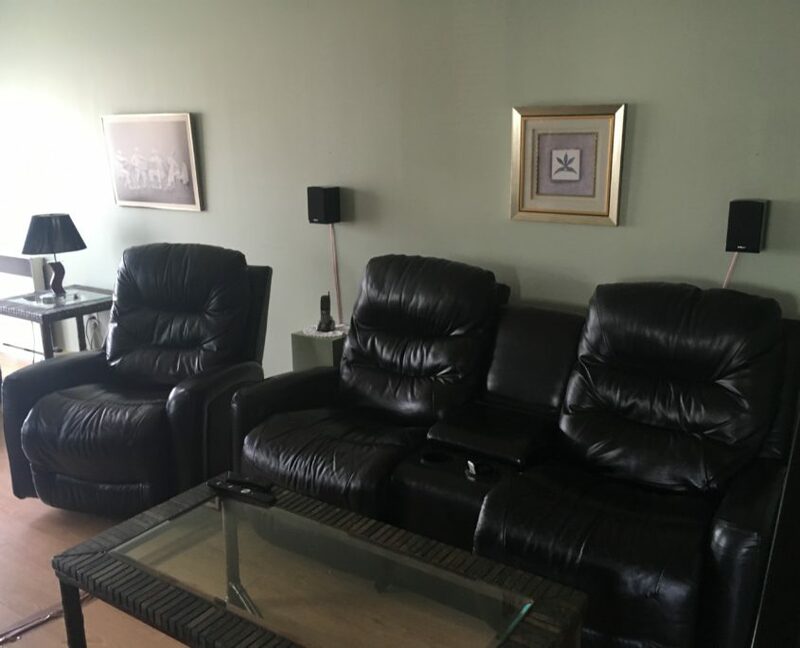 We are flexible and work with any scenario but as you can see from the before and after pictures below, furniture absolutely makes a difference in presentation and buyer impressions. 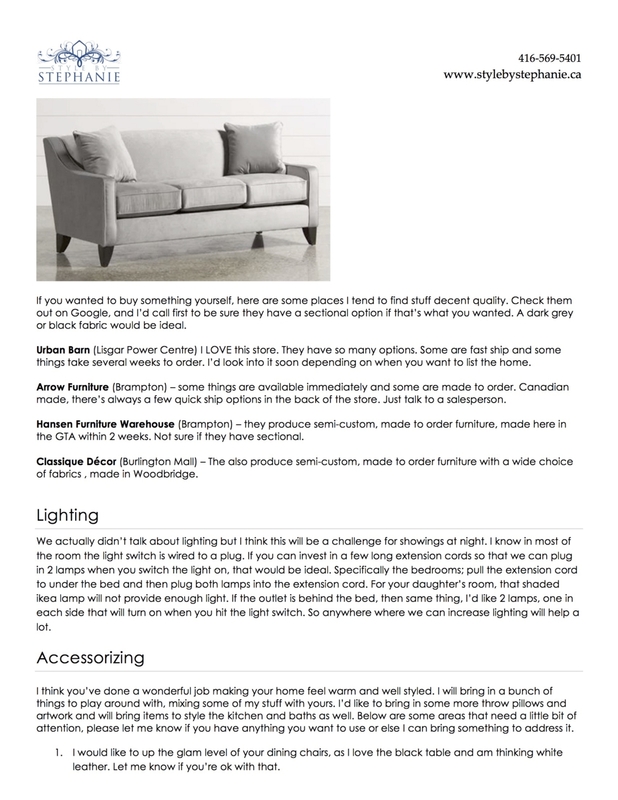 Stephanie has heard many times “Buyers are buying the house, not the furniture”. But what we say, is that buyers are really buying a dream, a lifestyle they crave to have. Everything about the house either shows them this dream, or doesn’t. It’s important to keep top of mind that buying a home is as much an emotional purchase as a logical one, and if you want the highest price for your home, you need to appeal to buyers on both fronts. 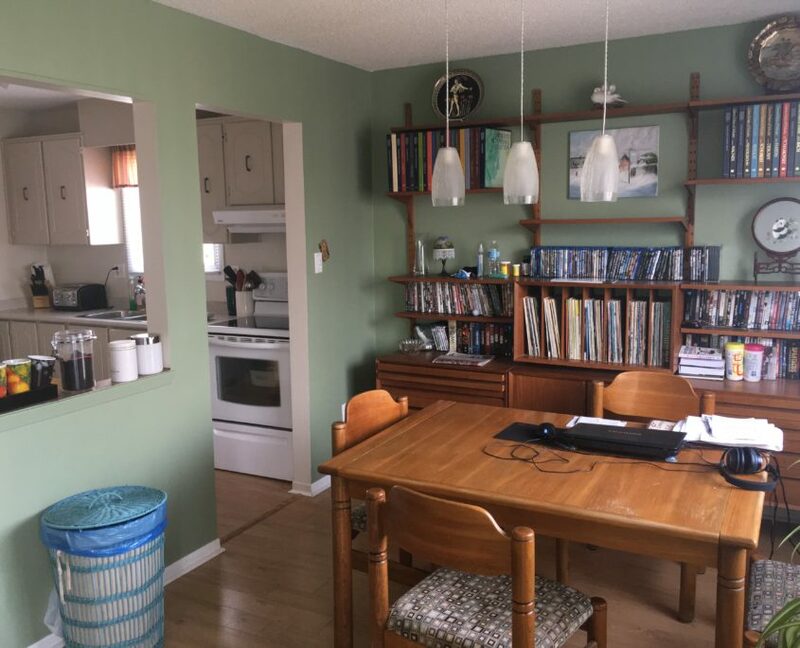 The owners removed the massive wall unit because they didn’t want to leave it with the house. 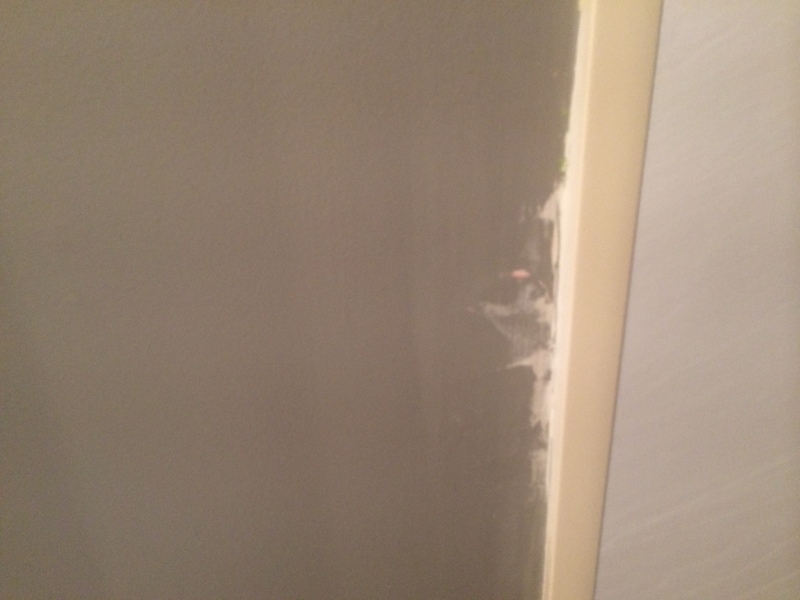 It would have left massive holes and they would have had to re-paint again for the new owners, so it’s best to just remove what you want to keep before you do any painting, and then the job is done once. In the photos of the dining room above, you will see that we switched out the pendant light for a modern pendant chandelier. As you look through our portfolio, you will see that we suggest this light all the time, and many of our clients love it and install it for their home. At the time, we weren’t worried about our portfolio and whether you would see the same light 10 times, we were thinking what is the cheapest, best light we can suggest to our clients? and for about $100 at Home Depot, this one wins quite often. 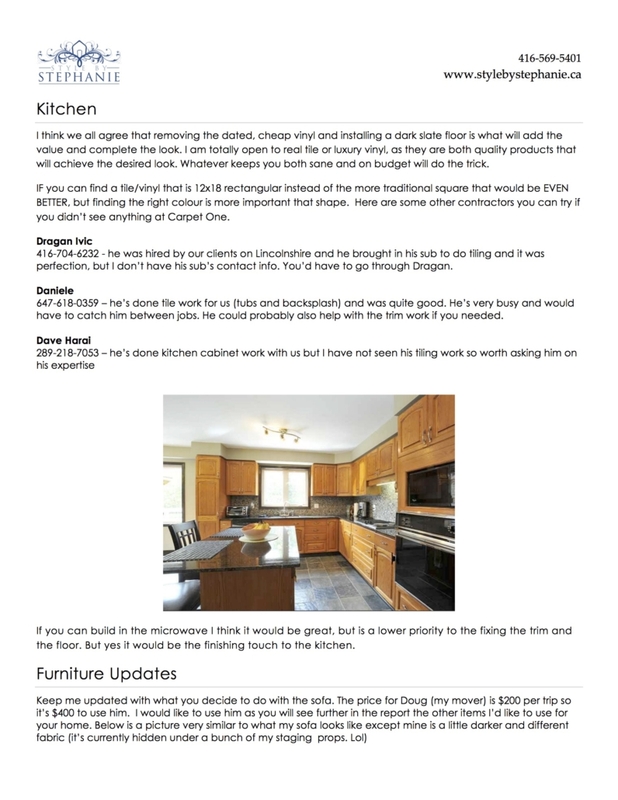 You, as a seller, are the only one who will compare all of our work side by side. With every listing, it’s a fresh set of buyers who have never seen our work before. We focus on getting the most impact for every single dollar you invest in your home. That is what’s most important. 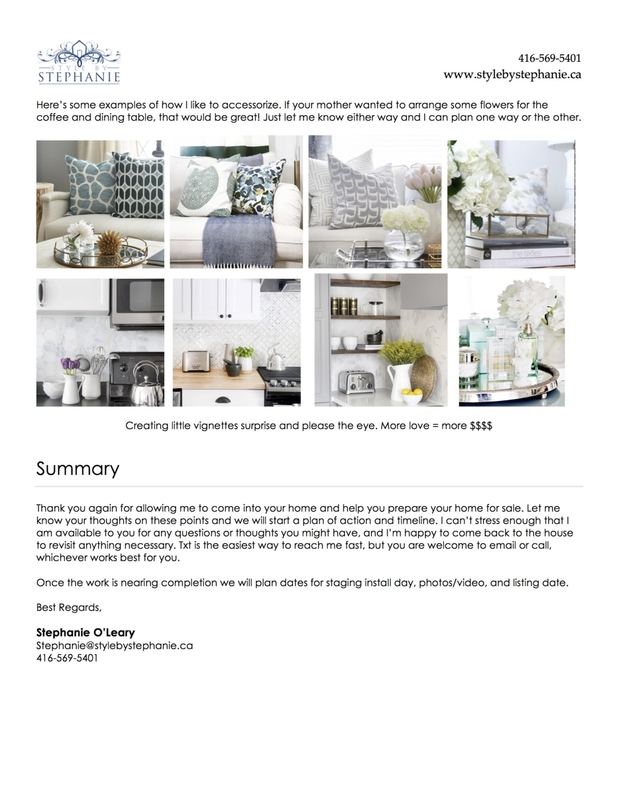 What is Home Staging, How Much Does it Cost and Who Pays?